I've also enjoyed seeing all the wins people have been getting and even though I feel happy for them it's great to win something yourself otherwise that green eyed monster is a terror! I was thrilled to discover, while going through my reader, that I had won some lovely goodies from the talented Hadley at Flying Blind On A Rocket Cycle. I was so happy, I cried. Not even joking (I can get very emotional when nice things happen!!). I was really coveting that bag (naughty me!) and was going to buy some of that fabric so I could attempt to make one myself but I don't need to!! There's an amazing bundle of goodies that she offered as a giveaway so I'm ridiculously happy I won and very grateful to her for being so generous! In my glee I worked really hard over the weekend. You'd think I could take a break after building a robot quilt but no, I have so much still to do before Christmas! This pattern is by the wonderful Amy Smart, whose blog Diary of a Quilter I love, and you can find the tutorial here! Cutting and sewing was a breeze, the tutorial is excellent and everything is explained well. If you are a numpty like me (or Susan, hahaha!) you might make a mistake getting those setting triangles the right way round. I only had to unpick twice but I was really annoyed at myself!! Concentration is key and it's actually really obvious if you're paying attention! Also I'm just not that good with angles :( The other part that freaked me out a bit was getting the squares to match up because of the sashing - I think I did ok with this though and got better as I went along. I was amazed how quick this was to do, quicker than straight line quilting it. I do tend to go really quickly, my machine just works better when it's fast (it's a Toyota, it really wants to be a car!). I also think it would be SO much easier if I didn't pin baste - must get some spray but that's not going to happen until next year so I'll be suffering through for the next one! I have to rinse and repeat... I'm making one more quilt like this for my other niece. They are 3yr old and 5yr old cousins, I'm hoping this is the right balance of cute and pretty for them! It will be nice for snuggling on the sofa when it's snowing in Glasgow!! Yeah pretty not perfect! I'm ok with it just now though, first attempt excuse again! Is it just me still slogging away (joke, I'm having fun really but seriously feeling the pressure!! ), is everyone else done making for Christmas? 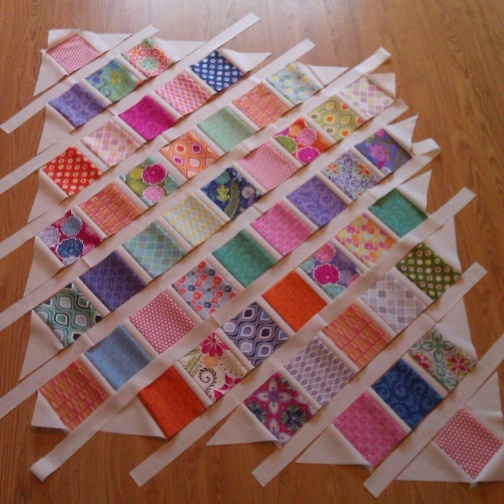 I'm linking up at Rainbow Hare Quilts and hoping to get and give lots of encouragement!! Lucy, you are completely insane!! Of course I mean that in the best possible way, though! You are amazing and I'm sure your niece will love that quilt. It is fabulous and your fmq is wonderful, too! Now get back to work! I'm impressed with how well this quilt turned out since you claim you're new at this. I'm sure your niece will be thrilled with it. It's fabulous - the lattice pattern really lets each of the fabrics shine! Lucy - fantastic on so many levels! Glad I'm not the only one still making for Christmas! Wonderful quilt AND quilting - yeah! for FMQ! And Yeah for this new positive attitude Miss Lucy! The name is pretty AND perfect BTW! You almost got away with that one! Hehe! i LOVE the lattice quilt! it's fabulous! Have fun with your marathon making this week. best of luck to you! WOW, the quilt looks fabulous! I certainly understand the slogging away for Christmas. I love doing it, but I'm ready for it to be done! It looks fabulous and I love your FMQ - well done! Keep going with the Christmas sewing, you can do it!! Your quilt is so sweet! I really heart your heart quilting! Stitched with love!! Your nieces will love these quilts! This is lovely, and the only person thinking it is less than perfect will be you! The nieces, and their Mums should be really thrilled with these, and the best thing is, in 20 years time they will be even more impressed, and pleased- I know this because my younger daughter still has her baby blanket on the bed, made by her Goddmother, and she is thrilled it was made just for her! My to do list got longer today - so you are in good company! It looks gorgeous Lucy! No surprise that I love the white sashing :) The spotty binding is perfect and the back is gorgeous too! Love your quilt...it is really charming. Just keep working on your FMQ it does great easier the more you do. Have you tried pressing your quilt before quilting. press the backing to the batting then turn and press the top. it bonds all the layers together, no need to pin at all on smaller quilts. only works on cotton or wool batting. Oh your niece will LOVE this! what a Lucky girl she is. I hope some day to make one like this too. The Lattice quilt looks lovely Lucy! And I love the hearts - I'm impressed! Yay, you! You are a machine! Great job with the quilt. I'm sure your niece with love it! Glad it turned out so nice, looks lovely! You're getting dangerously close to 100 followers, go you!